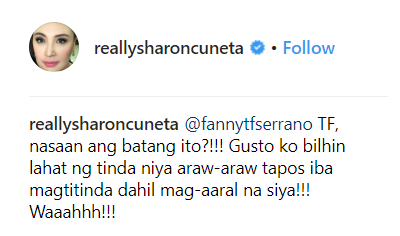 Home / Showbiz / Trending / Nais ni Ate Sharon Cuneta na pag-aralin ang batang ito matapos niyang malamang nagbebenta ito ng gulay sa murang edad! 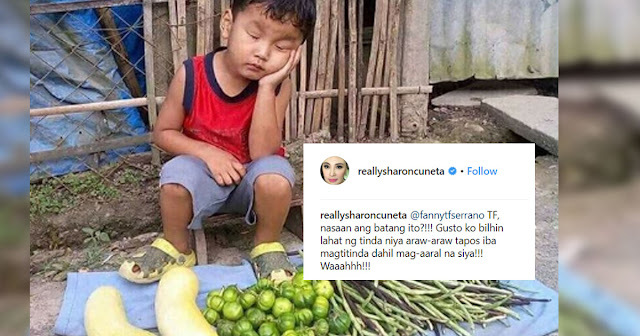 Nais ni Ate Sharon Cuneta na pag-aralin ang batang ito matapos niyang malamang nagbebenta ito ng gulay sa murang edad! Showbiz personalities can be expected to be great, but some of them also have a good heart! 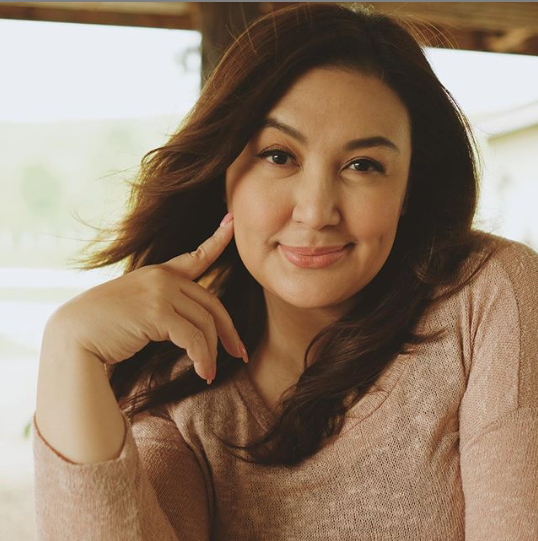 One prime example of that would have to be Megastar Sharon Cuneta! 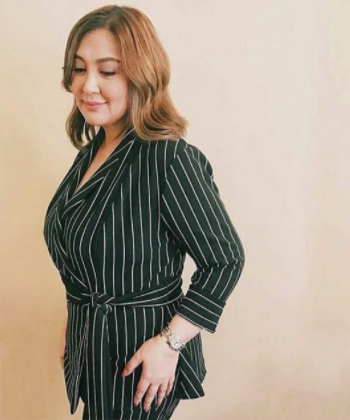 If you followed her TV shows across the years, you know by now that Ate Shawie really has a penchant for helping the unfortunate. It seems that despite all her successes and continued fame, Sharon Cuneta has not forgotten to help those in most need anytime she gets! She recently posted something that once again captured the hearts of Sharonians worldwide! She posted the photo of a cute, young boy who is selling vegetables. 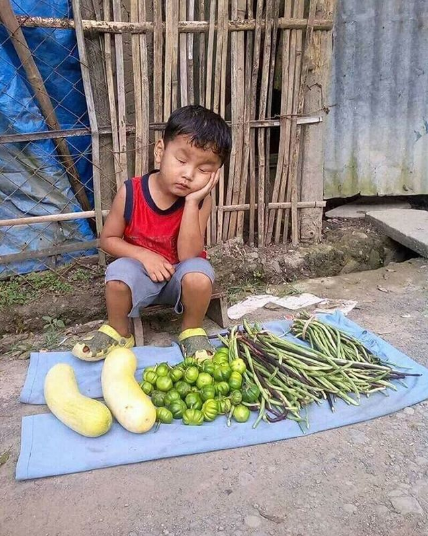 The adorable boy seems to be falling asleep while doing his chores, and this really melted the heart of Megastar. Sharon probably thought the boy was too young to be peddling vegetables for a living! That's why she posted a public call to identify and present the boy-- to whoever happens to know him! It would have been enough to offer to buy the kid's vegetables for one day, but Sharon wanted to do so much more than that! Ate Shawie wanted to see the boy spend his days in school, instead of on the streets selling vegetables for a living. To solve this, the 53-year-old Kapamilya offered to buy the kid's goods every single day, so he could get an education! As an educated person herself, the singer-actress-TV host is aware of how important education is. Unfortunately, looking at the comments on her original post, it seems nobody knows who the boy was or even where he could be found! Some netizens even suggested that the boy might not even be a Filipino! Hopefully, Sharon Cuneta one day stumbles upon this adorable kid, and be able to see through her dream of helping the boy. Still, her sheer willingness to completely change a boy's life is proof enough that Ate Shawie has kept her golden heart after all these years! Kudos to you, Mega! May God bless you more and more knowing you will always pay it forward!